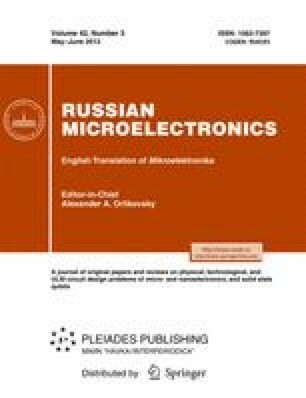 The article presents production methods and test results of field-effect transistor based on silicon nanowire made of heterogeneously arsenic-doped silicon on insulator (SOI). Dopant concentration has been varied over the depth of the silicon layer with a depth of 100 nm from higher than 1020 cm−3 to about 1017 cm−3. The field-effect transistor was manufactured from SOI using electron beam lithography and reactive ion etching. The upper highly conducting part of silicon layer has been used as a substrate for input electrodes and contact pads. The lower sublayer has been used for the formation of semiconductor nanowire. The current-voltage and gate characteristics of the transistor have been measured at 77 and 300 K. The possibility of using a field-effect transistor based on silicon nanowire as a highly sensitive local field-effect and charge sensor with nanometric spatial resolution for application in various fields of physics, technology and medicine has been analyzed. Original Russian Text © S.V. Amitonov, D.E. Presnov, V.I. Rudakov, V.A. Krupenin, 2013, published in Mikroelektronika, 2013, Vol. 42, No. 3, pp. 200–205.